The “Rustic Lace Square” is a very popular design/pattern, for obvious reasons as far as I’m concerned. For inspiration purposes you can find a lot of beautiful photos here, as well as the two creative makers that brought it into the world (here, here and here). 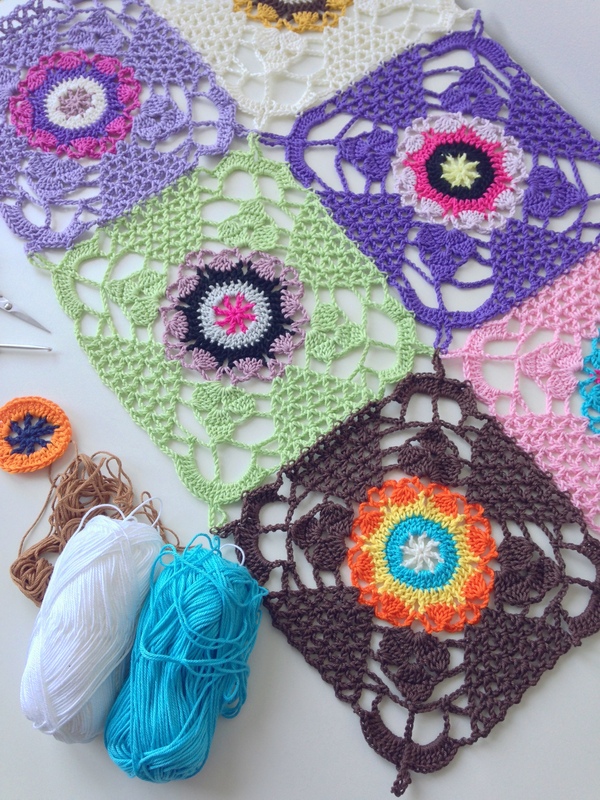 The lovely Susan, a dear instagram-friend, has a copy of the pattern in her feed (link here) and graciously allowed me to link back to this here. I also found the chart on Pinterest (link here), so there’s no keeping you back! Instead of having to join my squares at the very end, I decided to join-as-I-go and I thought I would share the little photo tutorial that I made. Joining your square to the next one starts in a (any) corner, right where the pattern asks you to chain 10 to make the big loop. You chain 4 and slip your hook into the loop of the square you want to attach this one to; make a slip stitch (equals chain 5 of 10) and crochet the remaining 5 of the 10 chains. 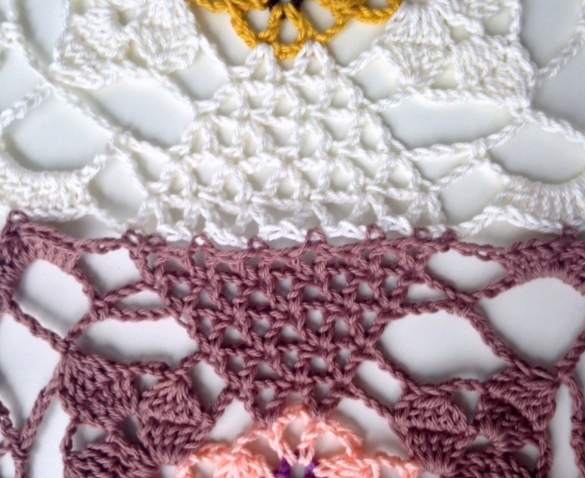 Continue with the pattern, crocheting 5 double crochets (UK: trebles); slip stitch into the 5th stitch (= 5th double crochet) of the square you’re attaching to, continue the remaining 5 dc’s. Chain 3 and make a slip stitch into the first stitch of the “trellis” part of the square you’re attaching to, in this case the purple one – this is a double crochet stitch. Crochet the first pole of the V (the V consisting of: 1dc, 2chains, 1dc) you need to crochet, in other words: crochet 1 dc, and then: 1 chain and slip stitch into the first V-space of the purple square; dc the last leg of your V: first V completed and attached! 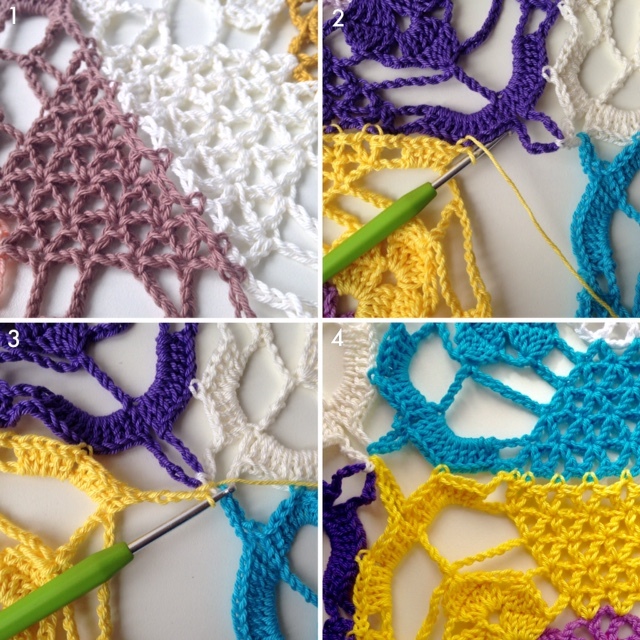 Continue attaching the (yellow) trellis part to the purple trellis: crochet your 1 double crochet of your V, chain 1, slip stitch into (purple) V-space (this slip stitch equals the 2nd chain of the V-stitch as per the pattern), finish your V by crocheting the last double crochet. 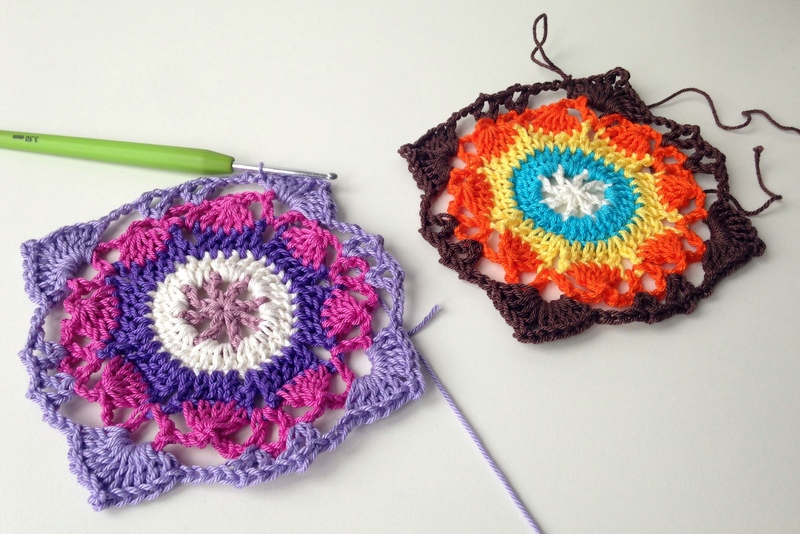 After you’ve completed your last V-stitch, you’ll want to slip stitch one more time and do this in the last double crochet of the V-stitch from the trellis of the square you’re attaching your new square to – in this case – the purple square. Kind of like you did when you first started attaching the yellow trellis to the purple one, slip stitching into the very first double crochet of the purple square; at this point you’ll slip stitch in the very last double crochet. When you’re done with your trellis, you should have 8 attaching slip stitches (see photo C 1 and/or image below). 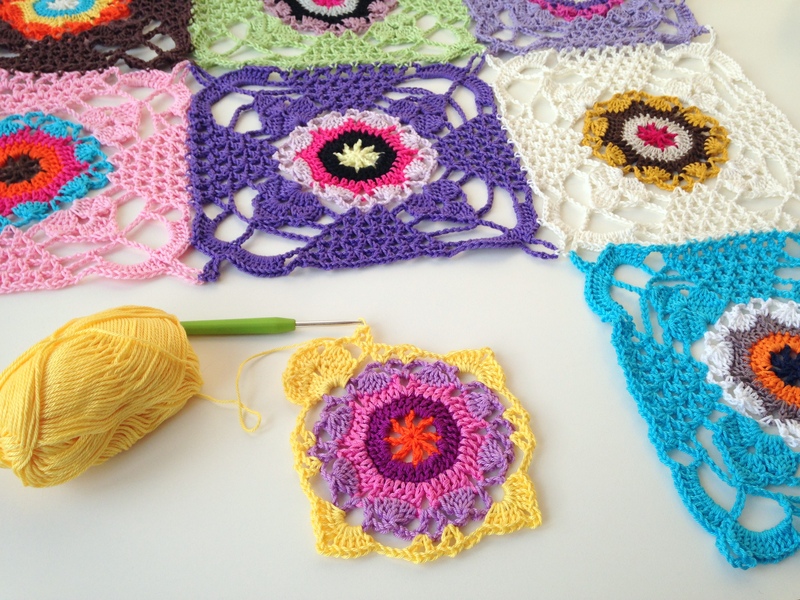 It was not until I was joining my 8th square that I was finally happy with the trellis part. At first I did not also slip stitch into the very first and very last double crochets of the V’s I was joining my square to. By creating 8 joints, the squares are finally attached to my liking, but of course that’s a personal preference. Ok, now onto the very last part. As per the chart: chain 3, crochet 5 double crochets, slip stitch into the 5th double crochet of the purple square, 5 double crochets. You’ve come full circle now – making the big chain loop, ready to attach it to the next corner of the next square, in this case slip stitching in the off-white loop (after which I continued joining my yellow square to the bright blue one). It seems like we always need a lot of words to explain something rather simple – I sure hope this is clear enough for you so zoom-join your pretty rustic lace squares! PS: I know everybody is keen on finding and giving credit to the original source/designer of the square – so am I – but so far to no avail. Latest news is that it was published in the “Para Ti – Guia de Puntos”-magazine, but as far as I know the source/designer has not been tracked down yet. If you have more information, please share!